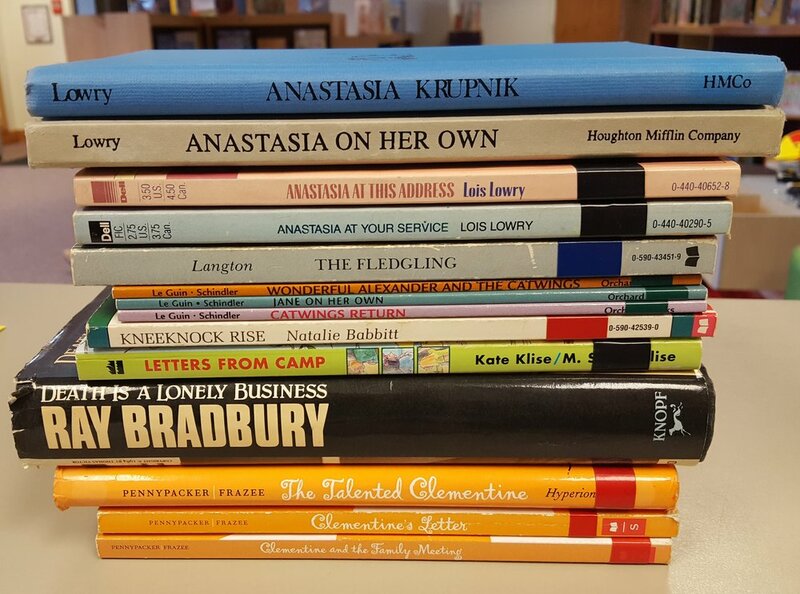 Anastasia Krupnik, Anastasia On Her Own, Anastasia At This Address, Anastasia At Your Service, by Lois Lowry; The Fledgling, by Jane Langton; Catwings Return, Jane On Her Own, Wonderful Alexander and the Catwings, by Ursula K. Le Guin; Kneeknock Rise, by Natalie Babbitt; Letters From Camp, by Kate Klise; Death is a Lonely Business, by Ray Bradbury; The Talented Clementine, Clementine's Letter, Clementine and the Family Meeting, by Sara Pennypacker. Well, I guess technically it's a DONATION JACKPOT, because most of them are beat-up enough that they wouldn't have made it to the book sale, but either way, JACKPOT. I've read a lot of Bradbury, but not in years, and I'm positive that I've never read Death is a Lonely Business, so YAY. I've only read the first book in the Clementine series, so it's clearly time to blow through the rest of those. I know that Kate and M. Sarah Klise have a bunch of newer books that I haven't read, so time to catch up there. WHY DO I WANT TO GO BACKWARDS AND RE-READ INSTEAD OF READING ALL THE NEWER BOOKS I'M SUPPOSED TO BE READING??? But obviously, for ME, the big score is the Anastasia books. 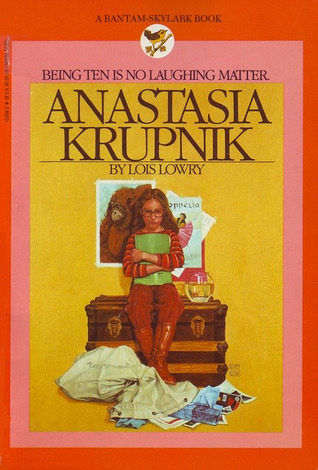 As it's been a full ten years since I've read Anastasia Krupnik, I think it's time for a re-read of the WHOLE SERIES. I think maybe there are even a few later ones that I haven't read? Looking into this sent me down a bit of a Cover Comparison Rabbithole. I feel that the first two are OBVIOUSLY the best ones, yes?